After graduating from school, I served my two years of mandatory alternative civilian service with a hospital gardener in Swabia. In Winter, every morning we used to come in one hour early to drink hot beer. 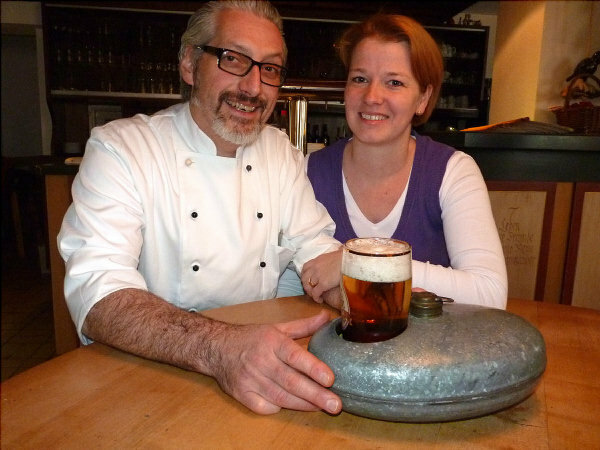 Warming beer – "stauchen" in German –, by placing the bottle in hot water, was common in the southwest of Germany, and althought the practice has fallen out of use in recent years you can still order your beer "gestaucht", i.e. warmed to about 50 to 60°C (122 to 140°F), in traditional restaurants (at no extra price, of course). No, drinking warm beer will not prevent the common cold. There was at least one study conducted revealing that humulone, an chemical found in hops, could help to fight a cold. This study seems to be both biased and exaggerated, as it was conducted by a beer company and the concentration in beer is so low that getting a therapeutic dose would create more problems than it would solve. Got a Cold? Have a Beer! I imagine that the rumor was based on either the above misleading story or a similar one based on a historical view of beer through "rose colored glasses". This coupled with the commonly known (and scientifically supported) method of drinking hot fluids to treat cold symptoms creates a believable enough tale to increase sales. Study finds hot drinks help colds. It certainly doesn't keep the cold away or reduce the duration, but I'll be damned if it doesn't make you feel better drinking it. Mulled beer is just nice when you're cold, and when you've got the cold, the last thing you want to feel is cold. Stews, casseroles, and chilis don't ward off the cold either. That doesn't stop people from eating ample amounts of them come autumn and winter. Neither do chicken soup nor porridge reduce the duration of a cold. That doesn't stop nearly every culture around the world from serving some variation thereof (or a mix of both, in the case of congee) to sick people. So, why stop there? Beer is nice too. All those things also help keep you hydrated, which can never be a bad thing if you're sick. Basically, if it makes you feel better, it may as well ward off disease. I mean, it's right there in the word. Dis - ease. A lack of ease. If it puts you at ease, it's a remedy in my book. There will be a very fine line that's easily crossed when using this as a preventative measure... Alcohol dehydrates the body which can weaken your immune system - your body needs lots of fluids to keep up it's normal function. Binge drinking has been clinically shown to lower the body's immune response. Your body needs all of the fluids, nutrients, and rest it can get to battle symptoms once it's full-blown infected. So, drinking WHILE sick is generally a very bad idea. With that being said, a shot of whiskey with lemon and honey might help relieve that sore throat and bring on that long night's rest that your body will be craving... Or, a warm beer (in theory.) Just the one, though! Although I don't have any medical data to back it up, I feel that the old remedy of drinking hot beer actually helps with cold. I live in Poland, and just like in Germany we do use this old world remedy of drinking warm/hot beer to keep the cold away. What's more is, that here in Poland serving warm beer with spices, sometimes with honey is really popular in the fall. And although my comment will probably get bashed by not having a medical back up -- it really feels like the warm beer helps the body fight off the bacteria/germs. Now that I think of it...The tradition of drinking warm beer is probably comparable to drinking mulled wine (in poland referred to as Grzaniec, and Glühwein in Germany). There seems to be much "science" that would document that warm beer has zero capability to prevent a cold. The question really asks why people "believe" that warm beer is successful in doing the job of preventing or helping the immune system of a physical body successfully deal with a cold. That "science" has so far failed to identify "why" warm beer or chicken soup is perceived by people as producing salutatory results is a failure of scientific vision. I would wonder this. - Is the immune system supported by the oils, liquid, and vitamins in chicken soup? If so, how is this accomplished. - Is the immune system supported by warm beer somehow? If so, how is the accomplished. I wonder if adding heat alone so the body can devote more of its energy to the immune system helps fight off the flue virus that produces the thing we call a cold. I wonder if the presence of herbs in beer helps the immune system in a way we do not yet pay attention to, or understand. Could it be, that at a vibrational level of frequencies, "home remedies" function successful to accomplish something that "science" does not yet understand. I do know that the Pentagon has used frequency science to deal with health issues via research done by Sharry Edwards per: Sound Health Options.